When hot days make me feel tired and irritable, a little bit of matcha seems to do the trick in keeping me feeling focused, cool, and centered. Making iced matcha is also incredibly simple, including this sparkling version! RECIPE BELOW. But first, what is matcha? Matcha is a Japanese green tea, made from shade-grown tea leaves, that are de-stemmed and de-veined, and then stone-ground into a fine powder. "Food-grade" matcha is cheaper for a reason: it's usually grown somewhere not in Japan, it's not necessarily fully shade-grown, and the tea leaves are ground whole! The stems are the most bitter parts of the leaf, so when the full leaves are powdered, you get a harsher, more bitter and astringent tea. This strong powdered green tea (that's what it is) is best used for culinary purposes. If you want the real deal, look for matcha that is 100% Japanese. Think of it like wine, it's all about terroir. The higher quality matchas will be creamy, silky and sweet, but also, a little more expensive and so much more healthier! Why does matcha make me feel good? If you want those good vibes, the way matcha is grown truly matters! In Japan, about a month before the tea leaves are picked, the tea plants are covered with tarps reducing the amount of sunlight the plants receive. This causes the plants to produce more chlorophyll, which gives the leaves their vibrant green color. This growing method also produces plants that have higher amounts of caffeine and amino acids. One particular amino acid called l-theanine promotes healthy cognitive function, a sense of calm, and an enhanced mood. In fact, tea (Camellia sinensis) and some mushrooms are the only sources of this amino acid! The best way to make matcha: take a scoop or two of matcha and sift it through a strainer into a matcha bowl. Add about 1/2-1/3 cup of hot water (not boiling!) and, with a bamboo whisk, immediately begin to quickly whisk in a "Z" shape until a froth forms. How does a lazy American (also me) make matcha on a hot day? Scoop some matcha into a tea strainer, and sift it into an insulated water bottle partially filled with ice (I use a HydroFlask!) Add cold water, and shake it up! 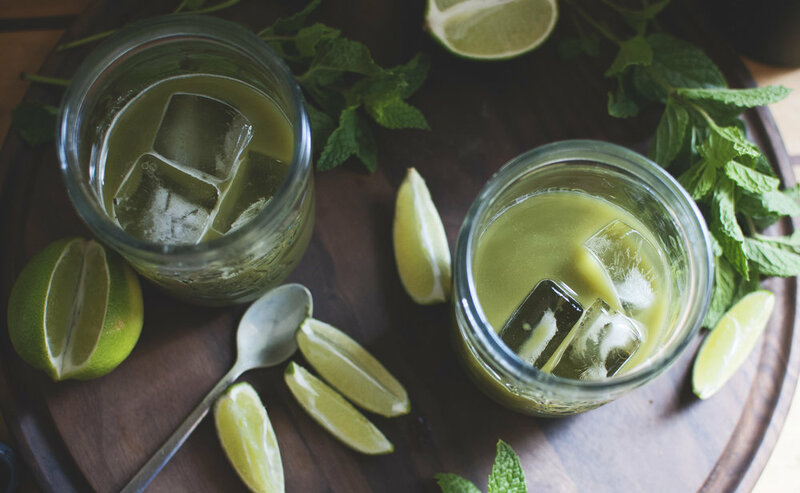 How do I make this TOTALLY REFRESHING sparkling lime-mint iced matcha!? Step 1. Fill a Hydroflask with a couple of ice cubes. Then sift 2 teaspoons of matcha through a strainer into the Hydroflask. This is an important step, because you want your matcha to be smooth, not lumpy! Step 2. Add 2 cups of cold water, some sprigs of mint (crush the leaves with your hands before adding them in), screw on the lid, and shake vigorously! Step 3. Pour the contents into two drinking vessels partially filled with ice. 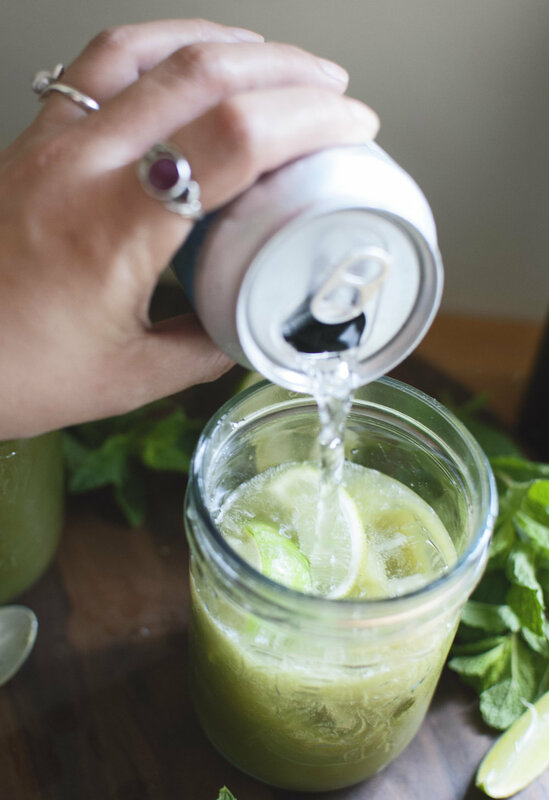 Top off with a squeeze of lime, a couple sprigs of mint, and club soda! And that's it! Optional, but recommended: make a quick simple syrup by dissolving 2 tbsp. of sugar into just enough hot water. Add this to your drink to sweeten it up! Instant tip: use a hot water dispenser. If you have extra energy, you can even make a batch of mint-syrup ahead of time, by dissolving 1/2 c of sugar into 1/2 c of water with a couple sprigs of mint over a stovetop. Spoon a little into your drink until it's as sweet as you like. WOW, just look at that brilliant green color! AWKWARD. It took so much effort to try to hold my camera with one hand, and squeeze a lime into the glass at the same time. I'm officially talented. Want to learn more about tea? Don't forget to check out this post 8 Things You Didn't Know About Tea.